Milk & Honey makes a sweet combo for kids! Growing up in church, I would always hear stories of Heaven and how there’s a land flowing with milk and honey. Well, thanks to the creative mind of Nichole Horiuchi, a little slice of heaven is right here on Earth. The Milk & Honey Baby & Kids Collection is angelic. Like a number of So Cal based lines, Milk & Honey is beach inspired. The line is very simple, yet unique. There’s nothing worse than fitting your little one in stiff clothes. But the movement in Milk & Honey clothes are like silk! 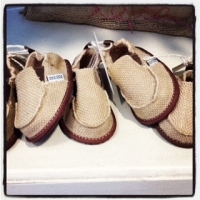 They even have baby hemp shoes!!! Can you say FAB? Or, you can simply shop online…. ← Little Maven hits BIG time!